Invest in residential property at Mahagun Projects in Noida. 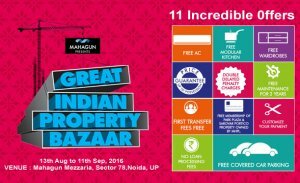 Mahagun Great Indian Property Bazaar brings 11 incredible offers for homebuyers those who are in search of residential property in Noida. These offers are valid from 13th August 2016 to 11th September 2016. Buyers can book 2 bhk, 3 bhk and 4 bhk luxurious apartments and Villas at Mahagun Moderne, Mahagun Meadows, Mahagun Mirabella and can save upto 15lacs*. Hurry up Now. Price Start 64.44 Lacs* | Save upto 15lacs*. Price Start 59.85 Lacs* | Save upto 15lacs*. Price Start 62.79 Lacs* | Save upto 15lacs*.